One of the best things about hunting wild turkeys, except for the fact that it’s a heck of a lot of fun, is that in most states, you can also hunt them two different times of the year. In virtually every state where legal, both male and female turkeys can be taken, making for a very different hunt than the gobbler-focused excursions in the spring. Here are some tips to ensure you foray this autumn is productive and fun. Wild turkeys are a gregarious lot that prefer hanging out in flocks once the breeding season of spring is gone. But those flocks are seldom mixed, with gobblers and older jakes hanging tight in small bands and hens with young-of-year jakes and jennies often found on larger, more vocal groups. Out West, where bands of Merriam’s and sometimes Rios must often flock to farm yards and ranching operations to find easy winter food, it is not uncommon to spot flocks that number in the dozens or even in the hundreds. Meanwhile, Eastern flocks, with abundant food spread throughout the forest and ag fields can often be found in smaller, albeit still impressive numbers of a couple of dozen birds. 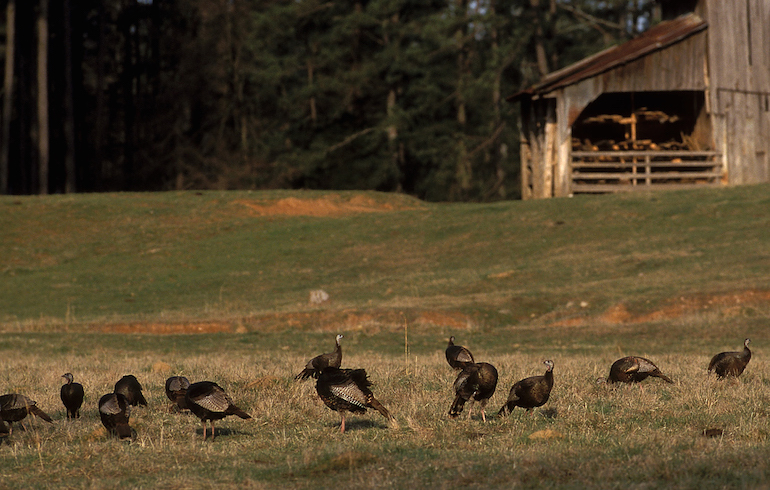 Due to more open terrain and a natural attraction toward agricultural settings, turkeys in the West are more easily located. Simply drive around and look or find a perch that affords a good glassing lookout and let your eyes do most of the walking. In the Midwest and East, where oaks and other mast can be dropping deep in the woods, finding flocks can be a little more challenging. A little preseason scouting is a good thing to determine where turkeys have been hanging out. Look for large areas of scratched up leaves where turkeys have been feeding, fresh tracks in fields and foot prints in muddy paths or along field edges. Freshly dropped feathers indicating where turkeys have lost them flying up and down to roost, and of course, fresh popcorn shaped or j-shaped droppings are all good sign of recent activity. In the fall, as flocks roam in search for food, they often travel in large circular patterns and just because they were in one area the day before doesn’t mean they’ll be in the same spot the next. The more days you can spend outside, the better your odds are of finding birds when they have retreated to the woods to feed on oaks and other mast. In swampy areas, turkeys generally like to roost over water where they feel safer at night. In the morning, they can then pitch down to the drier edges after sunrise. In hilly country, turkeys tend to pitch from trees onto slopes, thus reducing the distance they need to fly. Birds are much easier to locate in open country as roost sites will be more concentrated along drainages or tree-filled coulees and bottoms with birds heading to the safety of wide open spaces upon fly-down. Food sources to key on are the aforementioned oak flats where acorns are actively falling; grassy openings or damp water edges where insects and seeds remain plentiful in the still warm days of autumn; cut crop fields of corn, soybean and milo where waste grains offer a smorgasbord of feed for a turkey; and anywhere soft mast such as dogwoods, muscadine grapes or other fruits still cling to vines and limbs. If you’re having difficulty finding a flock to bust and hunt, save your hunting for a rainy day. That’s right, rainy days are great times to identify areas where birds are hanging out as the rain drives the birds into open fields where they are more easily spotted and located. Once the season opens, check with locals unless you are one, and hit spots where birds have been seen in the last several days whenever possible.